This Elstead Provence rise and fall pulley ceiling light in old bronze finish features period style and classic design. Featuring a stepped ceiling cup incorporating the top roller and braided flex threading through the heavy balance weight. The flex is attached to a large old bronze coolie shade that directs the light down onto your kitchen table, worktop or breakfast bar. A kitchen pulley rise and fall light taken from French designs in the mid 1900’s where they were most commonly used to light tables in the kitchen area, café’s and bistros. 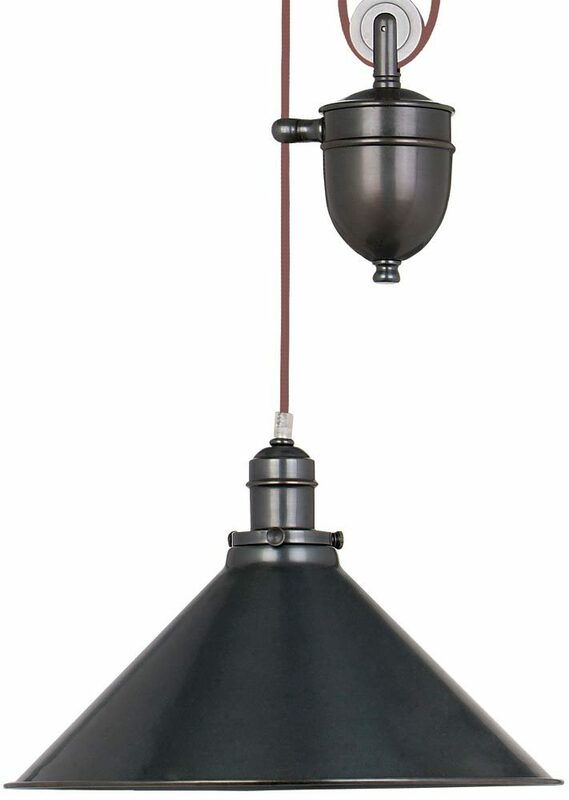 Using the weighted pulley, this fine quality old bronze kitchen pulley light can easily be changed in height from 96cm to 180cm to suit a variety of applications and is perfect for a modern home and lifestyle. There are matching fittings available in the Provence old bronze finish lighting range that can be viewed below. Also available finished in polished copper, polished nickel and aged brass; please enter the term Provence in the search box at the top of this page to view the complete collection. This classic light is supplied by Elstead Lighting, a British company that specialise in the manufacture and distribution of quality decorative lighting such as the Provence rise and fall pulley ceiling light in old bronze finish you see here.